RACV ELECTIONS SCORECARD: MAKE THIS A REFERENDUM ON THE EAST WEST LINK! MAKE YOUR VOTE COUNT! As you are aware the RACV, a supporter of the State government’s East West link, is currently holding elections for a new board. Traditionally only 60,000 of their 1.4 million members vote so this represents a real opportunity to “turn this years’ board election into a referendum on East West Link” (Trent McCarthy). 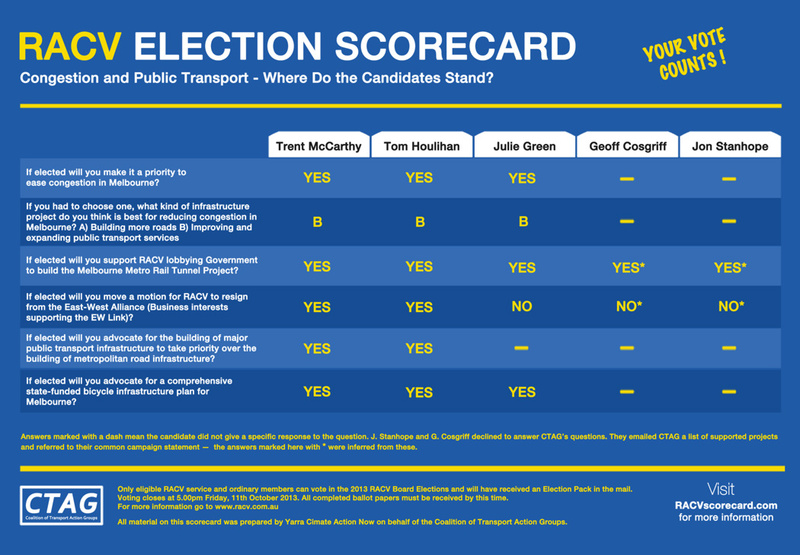 We encourage all public transport advocates who are also RACV members to vote in this election – the above scorecard indicates that at least three candidates oppose the East West Link. Ballots are being distributed with this months RACV magazine – remember to vote in this election – your vote can make a difference. The scorecard was prepared by Yarra Climate Action Now (Ycan) in consultion with Ycat for Coalition of Transport Action Groups (CTAG). Questions were addressed directly to candidates and the card indicates the candidates’ responses and attitudes to the East-West road tunnel.